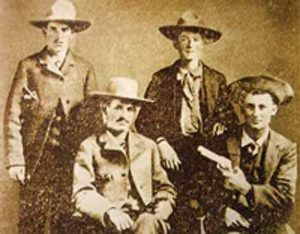 Sam Bass Gang, photo courtesy City of Roundrock, Tx and Robert G. McCubbin, Jr.
Jim Murphy (1861-1879) – A member of the Sam Bass Gang in Texas, Murphy got involved with the outlaws through Frank Jackson, who worked on the Murphy Ranch in Denton, Texas. Joining up with the gang, the outlaws got into a fight at Salt Creek in Wise County, where Captain June Peak and his Texas Rangers killed Arkansas Johnson, Sam Bass‘ most trusted lieutenant. Either just before or soon after this battle, the Rangers captured Murphy and another gang member named Pipes Herndon and drove Bass and his two remaining companions out of North Texas. After the fight on Salt Creek only Sam Bass, Seaborn Barnes, and Frank Jackson were left of the once formidable gang. These men had gained nothing from their four train robberies in North Texas, and were so hard pressed by the officers of the law on all sides that Bass reluctantly decided to leave the country and try to make his way to Mexico. Through some pretended friends of Bass, General John B. Jones, Commander of the Texas Rangers, learned of the contemplated move. He, with Captain Peak and other officers, approached Jim Murphy, who was awaiting trial by the Federal authorities for train robbery, and promised they would secure his release if he would betray Bass. Murphy then joined Bass in the Elm Bottoms. However, some of Bass’ friends, suspicious of Murphy’s release and bondsmen, wrote Sam that Murphy was playing a double game and advised him to kill the traitor at once. Bass immediately confronted Murphy with these reports and told Murphy plainly if he had anything to say to say it quickly. Barnes agreed with his chief and urged Murphy’s death. The plotter denied any intention of betraying Bass and offered to take the lead in any robbery Bass should plan and be the first to enter the express car or climb over the bank railing. Bass and Barnes were angry and decided to kill the liar at once. Frank Jackson had taken no part in the conversation, but, he now declared he had known Murphy since he was a little boy, and he was sure Murphy was sincere and meant to stand by them through thick and thin. Jackson finally told Bass and Barnes that they could not kill Murphy without first killing him. Although the youngest of the party at just 22 years old, Jackson had great influence over his chief. Bass and Barnes made a fatal mistake when they allowed Jackson to change their minds. Sam Bass, Seaborn Barnes, Frank Jackson, and Jim Murphy left Denton County early in July, 1878. Though he was watched almost constantly by Bass and Barnes, Murphy seized a rare opportunity to dash off a short note to General Jones letting him know they were headed to Round Rock, Texas to rob a bank. When the gang arrived the Texas Rangers were waiting. While Murphy stopped into a store, supposedly to quiz locals about the presence of lawmen, Bass, Barnes and Jackson hitched their horses in an alley just back of the bank then went to buy some tobacco. As the three bandits passed into the store, Deputy Sheriff Moore, who was standing on the sidewalk with Deputy Sheriff Grimes, said he thought one of the newcomers had a pistol. Approaching Bass and trying to search him, Sam said, “Yes, of course I have a pistol.” At the words, the robbers pulled their guns and killed Grimes as he backed away to the door. He fell dead on the sidewalk. They then turned on Sheriff Moore and shot him through the lungs as he attempted to draw his weapon. The outlaws then fled. Seaborn Barnes was shot and Killed, while Bass was wounded but, fled with Frank Jackson. However, he was badly injured and died the next day. Frank Jackson made his way back into Denton County and hung around some time hoping to get an opportunity to murder the betrayer of his chief, declaring if he met Jim Murphy he would kill him, cut off his head and carry it away in a gunny sack. Murphy returned to Denton, but learned that Jackson was hiding in the Elm Bottoms awaiting a chance to kill him. He then asked permission of the sheriff to remain about the jail for protection. While skulking about the prison one of his eyes became infected. A physician gave him some medicine to drop into the diseased eye, at the same time cautioning him to be careful as the fluid was a deadly poison. Somehow, he swallowed a large portion of it and died. Most accounts say it was suicide.